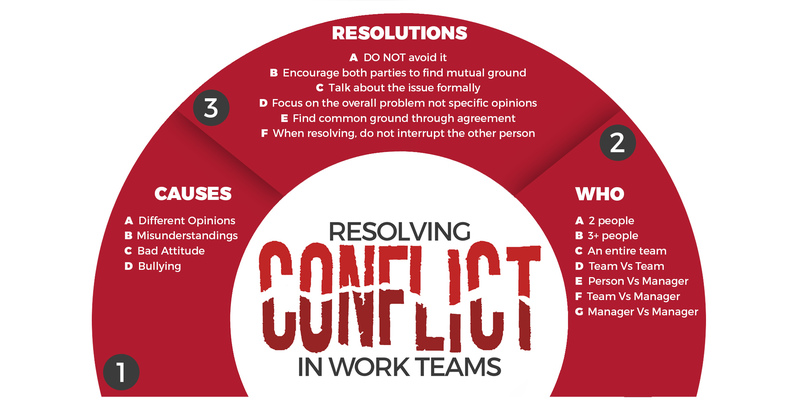 Conflict can be the one thing that completely breaks a team’s work ethic and morale, especially if it isn’t resolved in the right way. And of course, if you put a group of people together to work day in day out, conflict is bound to happen. From difference of opinions to misun­der­stan­dings. A successful workplace is always one that can handle conflict and resolve it to improve everybody’s attitude in the future. Conflict in work teams can occur between a number of people, two employees, an entire team, between supervisors or even team members and their manager. It can sometimes be quite difficult to try and sort conflict if it has never occurred before but when conflict arises it is important to not avoid it, if you do then the tension will only build more and therefore make the conflict worse. If you notice or get told about conflict between employees it is important to encourage them to find a way to work it out, whether they need to sit out together and talk through things or they need more of a formal way of going about it. But by doing this you will be able to address the issue head on and away from any other employees. Sometimes your team need help with mindfulness at work or motivating your team may help improve their overall attitude. This way you won’t cause any interruptions or disturb everybody else who is working. Make sure that when everybody is talking through there issues that they don’t go on the attack or assign the blame to a particular person. It is important to focus on the overall problem, not specific opinions from yourself of anyone else. Make sure everybody says everything that they wanted to as well as not being interrupted as they are speaking, that way everybody can take in exactly what people have said and hopefully understand where they were coming from. And from this you should then find agreement, since you will be going back and forth with people’s disagreements you need to within all of that find points of agreements and with that find positives instead of negatives. And from finding agreements and positives together everybody should then be willing to seek out a common ground and then focus on re-building a relationship together. And remember, if you are in a leadership position it will be your job to provide guidance for everybody and not take any sides yourself as that could make things worse. If you feel like team building will be a great way to bond your team then check out some of our activities.